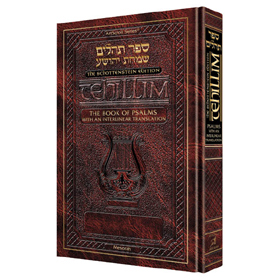 Thanks to an expert team of scholars, writers, editors, and graphic designers, ArtScroll’s new Interlinear Tehillim is here - the revolutionary new way to add meaning and understanding to prayer. Read. Recite. Pray. Understand the words -- and the flow. How much did you have to move your eye to look at the translation? Not a bit! How long did it take you to find the translation? No time at all! Did it interfere with your concentration? No -- it improved it! Comprehension seeps in as you pray. The great difficulty in this kind of treatment is reading Hebrew from right to left, and English from left to right. How to keep the eye from wandering in both directions and falling prey to confusion? Arrows unobtrusively direct your eye in the right direction. It’s a tested, patent-pending method -- and it works! But the syntax of Hebrew and English are different. Won’t the sentences sometimes be incomprehensible? That’s where the skill of the editors comes in. The comprehension is there. And wherever necessary, the commentary explains the flow of the verse. In addition, the commentary does what you expect an ArtScroll commentary to do: it explains and clarifies. This new Schottenstein Interlinear Series will elevate the standards of prayer for countless Jews for generations to come. Try this new Tehillim soon. You’ll feel elevated!